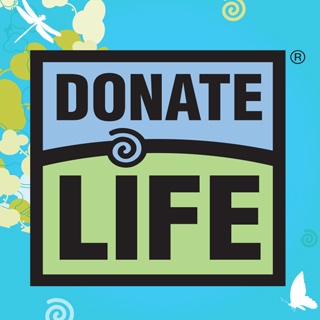 April is National Donate Life Month, and today specifically is Blue and Green Day, a day to honor and celebrate organ donation, a cause that is near and dear to my heart. On March 29, 2012, my dad received the wonderful gift of a new set of healthy lungs, and though he ultimately lost his battle six months later, we will forever be thankful to his anonymous donor and his/her family for their generous gift of life. My dad was a father, husband, brother, son, Paw Paw, beloved teacher, coach, and friend, and we treasure each and every extra moment we were able to spend with him. So I urge you all to please consider becoming an organ donor and make your wishes known to your family and friends. You never know when you'll be given the chance to give the gift of life to someone desperately in need.